Why storytelling is the best way to connect with clients. 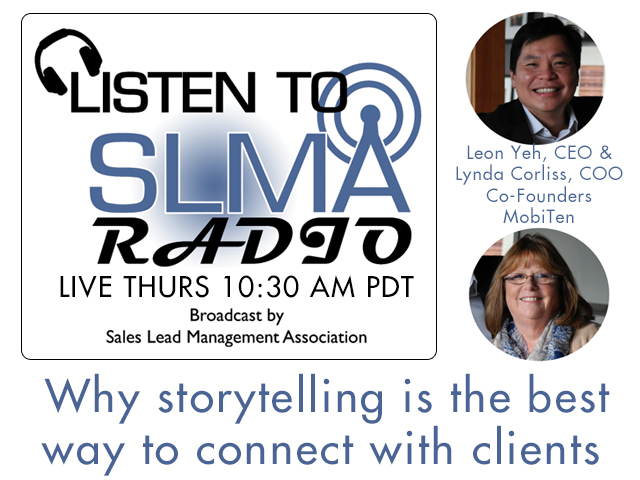 Host Jim Obermayer heard the MobiTen people, Leon Yeh and Lynda Corliss at a presentation during the Sales 2.0 conference hosted by Selling Power in Las Vegas in September. Their mobile application, Venta for the iPad, offers field salespeople intriguing technology, that helps sales people connect differently with clients, using something MobiTen calls Story Selling. Leon Yeh is CEO and founder of MobiTen, a mobile technology firm focused on creating progressive tools for sales and marketing teams. A 20 year veteran of enterprise web development for firms like Northrup Grumman and Toyota, he is passionate about the user experience. MobiTen's core mission is to create mobile applications that ignite customer engagement. As CEO, Leon is committed to his vision of using mobile technology to bring brand stories to life. Leon has a Master's Degree in Software Engineering from the University of Southern California. Lynda Corliss, Co-Founder and COO of MobiTen, has a background in IT Procurement, process optimization and Operations. With expertise spanning more than 20 years in IT procurement, licensing and contracts and later as the leader of Indirect Procurement for a large Biotech company. She specializes in creating win-win agreements for technology and services as well as creating programs that promote sound operating structures for Corporations such as Biotronik, ADP, Mentor Graphics, and Lockheed Missile and Space have worked with Lynda.